Anthropomorphic USR is a nostalgic throwback to the 90's comics and cartoons which made all the protagonists transformed animals with incredible powers and human like qualities. This rules lite system includes character generation tables, super cool equipment rules, vehicle action rules, custom character sheet as well as introductory adventure all at an unbeatable price! 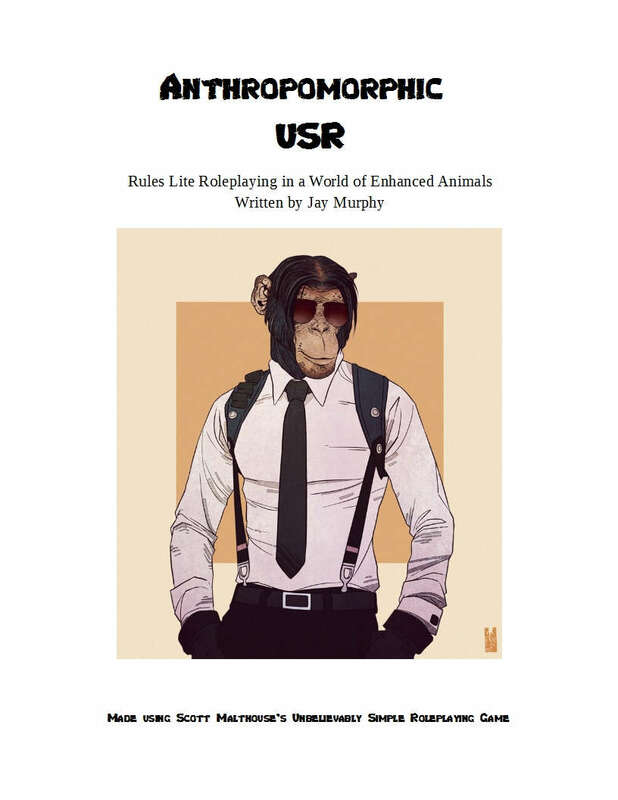 Anthro 3.00 PDF is now uploaded. Includes experience and character advancement rules! The POD file has been uploaded today so after I get a proof back in a couple of weeks I will be making a POD version available. So far happy with the result. At $1.95 for the digital file you have a complete game plus adventure! I've got a new copy available now as PDF. This PDF is being modified slightly for the A5 size soft cover color POD edition. Should be another two weeks before I see a proof copy of the POD edition. The PDF is good to go though. This title is currently going through a rewrite for a 6" x 9" POD copy. The current PDF will be left up for now. When new version is uploaded all will be informed.